Changing schools is anxiety provoking for most kids. Some are only mildly affected while others fret enough to lose sleep. 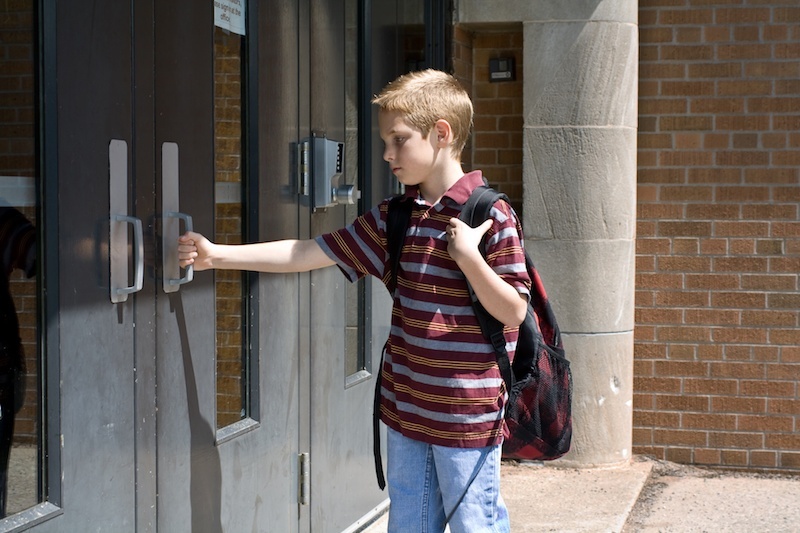 If your child has social or behavioral issues and struggles with any kind of change or transition, going to a new school can feel overwhelming and just too difficult. Fortunately, there are things you can do to help. Rigid kids with transition issues often have problems with routine disruption, fear of the unknown, a need to feel in control and low frustration tolerance, to name just a few of the reasons they struggle with change. To offset this, you can prep your child for a new school with gradual, repeat exposure to the school before the start date. This allows for the extra processing time that transition-averse kids so desperately need. Talk regularly about the new school and encourage question and answer chats. If possible, visit the staff beforehand and arrange a tour of the school. Learn the names of key support staff members and details about help for students who struggle, such as a sensory room for calming breaks or a learning program for attention issues. Photograph as much of the school as you can. Get a floor plan if you are able, as well as a school schedule, handbook or newsletter. Create a scrapbook for your child to regularly look through. Bookmark the school’s website and visit it often together. Consider writing a social story about changing schools. Post the new school schedule on the wall and refer to it periodically, and talk about what would be happening at school at that moment. Starting the week before the first day of school, have your child participate in a typical school morning routine that includes getting out of bed at the correct time. The day before school starts, continue that routine by going to the school and talking about the start of school the next day. Once you drop your child off on day one, your prep is finished. However, the work has just begun for the staff. If you have advice that you think could help them make your child feel successful, provide them with it in written form for their reference. List items such as anxiety triggers, calming strategies and preferred activities so staff is prepared with useful information. Even if the first day gets off to a rocky start, with support, your child will adapt. The preparations you’ve done will speed up this process by setting up your child up for a successful transition and, ultimately, a good school year.